In the extreme northwest of Gansu province lie the cliffs of Mogao, forming the eastern edge of Mount Mingsha and rising over the Dachuan River just 25 kilometres (15.5 mi) southeast of Dunhuang. The 492 caves dotted across the cliff-face were each hand-carved and were used to store some of the greatest Buddhist art in history, including over 2,000 painted sculptures, thousands of murals, and all manner of beautiful relics. This colossal achievement began sometime during the 4th century and ended roughly in the 14th century. Unsurprisingly it was designated a UNESCO World Heritage Site in 1987 and now remains one of the most popular attractions in Gansu. After all, when you’ve put one thousand years-worth of effort into something, you’d expect it to at least get noticed! The cave complex is separated into two sections: the northern caves, which functioned as living quarters, meditation chambers, and burial sites for the monks, and are artistically quite plain; and the southern ones, which were used for pilgrimage and are far more decorative. Like the good cups and saucers, the best paintings and sculptures were wheeled out only for visitors! The history behind these caves begins, rather unexpectedly, with failure! During the Han Dynasty (206 BC–220 AD), an envoy named Zhang Qian was sent on an expedition to the ancient country of Bactria, but this venture proved unsuccessful. 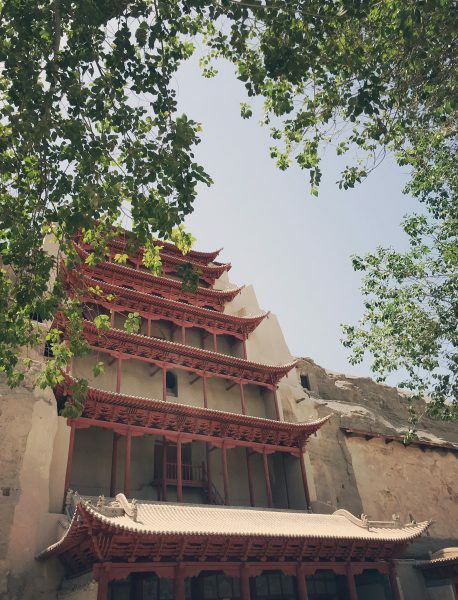 In a panic, the Han court built long sections of garrisoned walls along the northern frontier and, as a result, the city of Dunhuang was established as a military post in 117 BC. Rulers vied for control over this stretch of land since it contained the Hexi Corridor, which was an integral part of the ancient Silk Road and thus an invaluable asset at the time. Just imagine owning shares in Microsoft, and you’re on the right track! Frequent conflicts meant that Dunhuang would regularly be cut off from the imperial court for long periods at a time, and this enabled the city to become far more cosmopolitan. Merchants, scholars, and monks from across Asia would settle in the city, propagating anything from Buddhism and Nestorianism to Persian rugs and Egyptian cotton! Separated from the state as it was, this meant that the building of the Mogao Caves could begin in 366 AD, even though the imperial court didn’t acknowledge Buddhism as a religion until 444. According to an ancient book known as the Fokan Ji by Li Junxiu, a monk named Le Zun started carving out the caves after he had a vision of one thousand Buddhas bathed in golden light. This is why the Mogao Caves are occasionally referred to as the Caves of the Thousand Buddhas. As more monks travelled to join Le Zun, the site swiftly flourished, although it initially served only as a place of meditation for monks and didn’t become a place of worship for the public until the Sui Dynasty (581-618). It reached its peak during the Tang Dynasty (618-907), when evidence suggests there were well over 1,000 caves. So it seems Le Zun’s vision was right, give or take a few caves! Each cave was elaborately painted and served a purpose, whether it be to aid meditation, provide a visual representation of enlightenment, or simply to serve as a teaching tool for those who were unaware of Buddhist scripture. 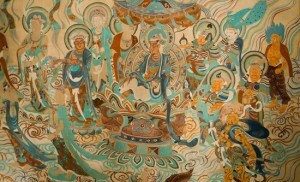 Yet interestingly not all of the caves are religious, as several of them depict secular themes such as pivotal moments in Central Asian history. 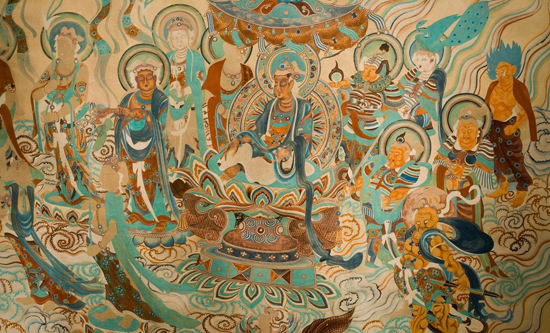 The complex boasts a great variety of painting styles, with the earlier caves showing more of a Western influence and those built during the Tang Dynasty onwards incorporating an amalgamation of Chinese and Central Asian styles known as the Dunhuang style. Some of the most decorated caves have paintings all over the walls and ceilings. It’s hard enough just painting a single room one colour, so imagine trying to cover it with beautiful murals! In terms of the sculptures, the most famous are two giant statues of Maitreya Buddha, one towering in at nearly 36 metres (118 ft.) and the other a respectable 27 metres (88.5 ft.). The former was constructed in 695 and has had to be repaired multiple times, meaning only the head retains its original appearance. The latter was completed in 741 and is in far better condition, with only the right hand having been replaced. Towards the end of the Tang Dynasty, the site gradually declined and construction of new caves had ceased entirely by the Yuan Dynasty (1271-1368). As Islam slowly conquered much of Central Asia and the Silk Road was superseded by sea-routes, the popularity of Dunhuang and Buddhism plummeted. During the Ming Dynasty (1368-1644), the city was steadily abandoned and the Mogao Caves were all but forgotten. The 20th century saw renewed interest in the site, where it became popular once again as a place of worship. 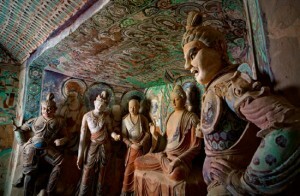 By this time, many of the caves had been blocked by sand and a Taoist monk named Wang Yuan-lu set about uncovering them. In 1900 he made perhaps one of the most significant discoveries of the 20th century; a walled-up cave containing 45,000 manuscripts! This vast ancient library housed 1,100 bundles of scrolls and over 15,000 paper books, ranging in topic from Buddhist scriptures to historical records. Unfortunately Wang opted to sell numbers of these manuscripts to foreign archaeologists such as Aurel Stein and his reputation suffered greatly as he was condemned for the loss of these artefacts. The cave originally functioned as a memorial for a resident monk named Hongbian and served as his personal retreat during his lifetime. The documents in the cave range in date from 406 to 1002 and were found alongside other Buddhist paraphernalia such as figurines, textiles, and banners. It appears to have been sealed sometime during the 11th century, although historians are not exactly sure why. Some believe it was simply a repository for preserving documents, while others suggest that it was closed up to protect the contents from an incoming invasion. Perhaps, even in death, Hongbian was just a little tired of people constantly walking in and out of his private hideaway! While the majority of manuscripts are in Chinese, several are in various other languages including Tibetan, Uyghur, Sanskrit, and even Hebrew. The grandest discovery came in the form of the Diamond Sutra, which dates back to 868 AD and is the earliest printed book in existence. The insight these works have given into the history of Central Asia is invaluable and the illustrious heritage of the site echoes throughout its many caves. Maitreya: In the Buddhist tradition, Maitreya is a bodhisattva who will appear on Earth sometime in the future and achieve complete enlightenment. He will be the successor to the present Buddha, Gautama Buddha, and is thus regarded as a sort of future Buddha.